Get a free SEO audit to help customers find your website! Better sales results start with helping customers find YOUR website instead of your competitor’s! Are customers finding you online, or are they finding your competitors? Here’s one way to find out. Our free SEO audit will be sent to you automatically in just a few minutes, and will let you know how much traffic your site is getting. 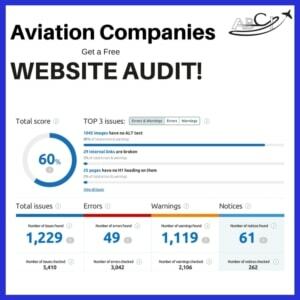 The report will also list things you can do to improve how people can find your site when they’re searching for the aviation products and services you offer. It’s free, there’s no obligation, and we respect your privacy. We work only with aviation companies, and it’s a small world so our reputation is VERY important to us. We don’t rent or sell your information to anyone, and promise you’ll have a positive interaction with us. Enter your website in the form below, and the email where you’d like us to send your report. Aviation Companies – get a free report that outlines what’s great about your online visibility and search engine optimization!https://topspyapps.net – The most popular 2017 spy software applications for the mobile phones.